Robert Lee Hotz, Technology Review (October 1997) 23–29. He conducts secret experiments alone after hours at the software company he founded. He has the arrogance to announce that he's going to reinvent physics—and though he won't share his findings with anyone, his colleagues think Stephen Wolfram just may be brilliant enough to do it. In the bright sunshine filtering through Caltech's blooming jacaranda trees, there is little to distinguish the plump, middle-aged physicist from the knot of faculty and students outside the university auditorium, save the tiny StarTac cellular phone clipped to his baggy black trousers, his laptop computer—the thinnest money can buy—and the attentive publicist who carries it for him. Working up his nerve, a 17-year-old Caltech physics major edges up to the man and asks him to autograph a set of computer disks. The physicist is Stephen Wolfram. The disks contain a computer program he designed called Mathematica, the centerpiece of the $100 million company he founded after leaving academia in 1986. As Wolfram scribbles his signature with a modest flourish, he seems to savor a moment of perfect personal equilibrium, such as a tightrope artist might enjoy after a back flip on the high wire, kept aloft solely by his faith in himself. Indeed, many consider Wolfram one of the most intriguing high-wire acts in physics today. Working without a net—the security of an academic position or the collaboration of colleagues—Wolfram is using the pattern-generating capacities of computers to try to uncover fundamental rules underlying the extraordinary, chaotic complexity of the universe. In doing so, he says, he is rebuilding physics from the bottom up by developing techniques that rival the mathematical equations conventional physicists use to describe and predict events in the world around us. To physicists, mathematics is a language. It offers a vocabulary—geometry, calculus, and quadratic equations—that allows them to describe many of the properties of the universe, from the relationship between the radius and the circumference of a circle to the behavior of subatomic particles. Its most famous epigram—E=mc2—conveys in poetic shorthand the frozen energy of mass and the power to destroy cities. But traditional physics has been unable to explain many common phenomena in nature, from the singularity of snowflakes to the self-organizing properties of neural networks in the human brain. Simply put, they are too complex. To investigate these phenomena, many scholars, including Wolfram, turned to the emerging field of complexity theory. Complexity theory seeks explanations for apparently unpredictable phenomena—the flight of a swarm of bees, the ebb and flow of the stock market—in the interplay of their myriad simple components. In each case, individual actors—bees or brokers—make separate decisions based on simple rules; taken together, their actions create dynamic, apparently random patterns. Wolfram and his colleagues believe the complexity of the universe belies an underlying simplicity in which a few basic rules give rise to complicated and unpredictable behavior. Indeed, if one conceives of God as a clever programmer, then one can imagine our vast, expanding universe as the elaborate consequence of an algorithm that set the conditions of the cataclysm known as the Big Bang. Everything that has followed—from black holes and organic chemistry to the rise of human consciousness and the spontaneous melody of a jazz improvisation—is an inevitable result. Some of the rules that govern the behavior of the universe, we know: the laws of motion, the speed of light, the relationship between matter and energy. Others, however, may be embedded in systems so complex that they defy conventional analysis. To investigate the universe from this new perspective, scientists like Wolfram use computer simulations the way previous generations of scientists used microscopes, radio telescopes, cyclotrons, and particle accelerators. To the extent that the universe may be like a computer obeying a programmer's instructions, they argue, computer models are the best device for learning how it works. Wolfram says the computer experiments he has been conducting after hours at Wolfram Research in Champaign have led him into a new world of basic science. The problem is, he won't tell anyone what he has discovered there. He has not published a formal research paper in years, nor has he presented his findings at any scientific conference, though he does promise eventually to publish them in a book. Even close colleagues say they know only the general outlines of his work. "Is there a simple computer that is the universe—a logical representation of how the universe fundamentally works?" Wolfram asks. "I will admit to having made quite a lot of progress on that question. It strongly encourages me to say the answer is yes." But for now, that is about as much as he will reveal of his research. With almost any other scientist, Wolfram's secretive midnight computer hacking might be dismissed as eccentricity or—less charitably—as the activity of someone unwilling to accept the consequences of his career choices. His erudite patter on the future of physics, modulated by his soft British accent, might seem just so much high-tech hyperbole, the kind of self-promotion that is as much a part of software packaging as shrink-wrap plastic. (This is, after all, a man whose corporate press release describes him as "one of the world's most original scientists.") So why is anyone listening? "If I were less well known, people would just say, 'The guy is a nut case. Forget him,'" Wolfram admits. But a remarkable number of respected computer scientists, physicists, and mathematicians seem, for the moment, to have suspended their disbelief. Some say they take Wolfram seriously because of his published record as a physicist, his work developing Mathematica, and the strength of his intellect. "Everybody, himself included, has been looking to him for a major contribution," says physicist Norman Packard, who helped Wolfram establish the Center for Complex Systems at the University of Illinois. The founder of a financial analysis firm in Santa Fe, N.Mex., Packard now applies complexity theory to help Swiss banks play the stock market. Others stress the potential of the emerging field of computational physics. Neuroscientist Terry Sejnowski, who researches complex neural networks at the Salk Institute for Biological Studies in La Jolla, Calif., says Wolfram offers a "vision of the future of science"—a science "based on computational principles rather than the classical mathematical tools that so many generations of scientists have relied on." "I think what he is doing goes to the bedrock of particle physics," Sejnowski says. "He is talking about a computational [model of the] universe based on quite new principles." "If he succeeds he will make us rethink the world we are in," says Steven Levy, author of Artificial Life, an introduction to the emerging field of computer-driven complexity studies. "I think he has a shot at it." Wolfram has come to Caltech to lecture on Mathematica as part of a 15-city tour to publicize the release of the newest version of the $1,295 software package. The encounter is also a personal homecoming of sorts for the 37-year-old CEO. When he was barely out of his teens, the baby-faced doctoral student was Caltech's impatient wonder boy, a rising star whose work applying high-energy physics to cosmology was bright enough to attract the interest of Nobel laureates Richard Feynman and Murray Gell-Mann. But on this day at Caltech, mellowed by age, marriage, fatherhood, and commercial success, Wolfram no longer resembles the study in adolescent impetuosity who was known to choose his vacation spots simply by buying an airplane ticket to whatever destination appeared at the top of the departure board. Over a lunch of pork tenderloin and a green salad, Wolfram politely deflects personal questions about his wife, who is a mathematician, and his newborn child, out of privacy concerns prompted by the Unabomber case. But he talks eagerly about his extensive collection of seashells, the many dead ends of contemporary physics, and the proper role of a scientist in a free-market society. A self-taught prodigy who never bothered with an undergraduate degree, the English-born Wolfram published his first paper on a problem in particle physics at 15. After stints at Eton and Oxford, he received his Ph.D. in physics from Caltech at 20. At 21, he made headlines as the youngest person to receive a so-called genius grant from the MacArthur Foundation. The grant was based on the quality of his intellect more than on any single body of work and was intended to give Wolfram the freedom to step outside the mainstream, explains Kenneth W. Hope, an assistant dean of social sciences at the University of Chicago, who administered the MacArthur grant program. "He was so remarkably smart," Hope recalls. "He dazzled a lot of people." "Working with him [was] like playing basketball with Michael Jordan," says Rocky Kolb, a professor of astronomy and astrophysics at the University of Chicago, who coauthored 10 papers on high-energy physics and the nascent universe with Wolfram early in his career. "He pushes." Indeed, his talent and ambition seemed to be matched only by his arrogance. Described as brash even by his friends, Wolfram had an "amazing lack of respect for the work of other people," Levy recalls. He hurried through a succession of prestigious faculty positions at Caltech, the Institute for Advanced Study at Princeton, and the University of Illinois, leaving patches of bad feeling smoldering behind him like a series of burned bridges. He left Caltech after a dispute over the ownership of a computer programming language he developed. At Princeton, colleagues recall, his reliance on electronic computation seemed to unsettle older scientists more accustomed to slide rules and chalkboards. His impatience with academic formalities and faculty politics soon led him to relocate to Illinois, lured by the possibility of greater independence and the promise of quick tenure. At Illinois, however, Wolfram "stepped on a lot of toes," Packard says. "The political game of the university is a complex one and is not always amenable to the brash, demanding whiz-kid interloper." Again, impatience won out. And when he spurned academia for the business world, many felt he had left his promise unfulfilled. But in dozens of influential research papers, he had left his mark on physics, cosmology, computer science, and complexity theory. In 1981, for instance, he independently reinvented cellular automata, a concept that mathematicians John von Neumann and Stanislaw Ulam had created in 1953 for modeling complex systems on computers. Wolfram subsequently used them to create a widely used system for classifying complex phenomena. The publication of his papers on cellular automata helped to lay the groundwork for the development of the field of artificial life, a branch of complexity studies that uses computer modeling to simulate ecosystems and explore patterns of evolution. Christopher Langton, director of the Artificial Life project at the Santa Fe Institute for Complex Studies in New Mexico, emphasizes the importance of Wolfram's work to the development of the field. "I don't think there is any doubt that Stephen Wolfram made fundamental contributions. His original work on the statistical mechanics of cellular automata singlehandedly revitalized the field and has served as the basis for countless other contributions by thousands of researchers around the world." Wolfram was also a "prime instigator" in creating the field of computational physics—the use of computers to model problems in basic physics—notes Gerald Tesauro, a physicist at the IBM Research Division's Thomas J. Watson Research Center in Yorktown Heights, N.Y. To some extent, Wolfram's difficulties in academia stemmed from the interdisciplinary nature of this new field, which cuts across the organizational grain of academic departments, tenure tracks, and faculty prerogatives. According to his former collaborators, the physicist encountered considerable difficulty in obtaining funding for his work through conventional academic channels. Several computer scientists suggest that Wolfram may also have been handicapped by a lingering skepticism among some members of the scientific community about the true value of the kind of computer research he performs. Computer experiments, the skeptics say, are only elaborate electronic games with little or no connection to the real world. Indeed, the very first such computer program, a pattern-generating program Life, was once distributed as part of a commercial package of computer games. "There may have been some element of a question mark regarding the kind of science that Stephen represents," Packard says. "This kind of science is new and not exactly easy to take for the traditional scientific community. But I think it has more to do with the intrinsic difficulty—intellectually, politically, and culturally—of getting academic disciplines to really embrace interdisciplinary research." 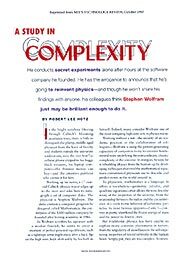 Wolfram's impatience with the organizational constraints of academia matched his mounting frustration with the mechanics of coaxing computers to model the hypotheses he wanted to pursue, a dissatisfaction that drove him to develop Mathematica. "Quite early on, I was interested in doing experiments on computers," Wolfram recalls. "One of the things that held me up was that I just didn't have the right tools to do what I wanted to do. I spent a lot of my days writing a lot of pieces of software to support these experiments. I realized this was silly. I was spending lots of time putting together tools which in some cases could be quite general tools, but I was putting them together for very specific computer experiments. "'Maybe,' I thought, 'there is a better way to do this.'" And what is Mathematica, exactly? Even Wolfram and his marketing department are hard pressed to give a simple description of this comprehensive mathematics processing program. Incorporating hundreds of math and physical constants and the world's largest collection of mathematical formulas, it offers a wide range of computational tools for scientists, engineers, and mathematicians interested in computer modeling and simulations. The program not only performs calculations but also generates graphics and provides the formatting tools of desktop publishing so that researchers can present their work. It is a versatile tool shaped by each user's individual purpose. Researchers have used the software's modeling capabilities to solve problems as diverse as designing the bicycle track for the 1996 Olympic Games, predicting flow rates of molecules in commercial shampoos using various kinds of ingredients, and determining how tidal waves evolve as they sweep toward shore. So many computer-graphics artists have used Mathematica to create arresting geometric images that Wolfram opened an art gallery on his company's web site. According to the company's estimates, a million researchers in 90 countries use the program, including all the Fortune 500 companies, the federal government, and the world's 50 largest universities. The program has competitors, such as Mathcad, Scientific Workplace, and Theorist. But with the newest release of Mathematica—Version 3.0—last fall, Wolfram "established his superiority," says Columbia University civil engineering professor Gautum Dasgupta, who uses Mathematica to model the effects of major earthquakes. As head of an international teaching group, he also uses the program to develop computer tutorials for universities around the world. Dasgupta credits Mathematica's "overall comprehensive approach" with distinguishing it from other, more specialized programs. Other users note the program's emphasis on technical innovation—in which they see the characteristics of the man who designed it. To produce the most recent version, Wolfram spent two years rebuilding the program from the ground up. Now he has vowed to reconstruct the world of physics, using Mathematica as the intellectual tool to do it. Researchers like Wolfram turn their backs on the world outside the laboratory. They gaze instead through the windowpane of a computer monitor into a hypothetical universe, harnessing the power of the computer to explore the behavior of mathematical structures and complex systems. Every computer program embodies an algorithm, or a set of instructions, that governs the way numerical data are modified by the computer, much as the laws of nature govern the way objects behave in the real world. To conduct experiments on a computer, Wolfram explains, researchers use numbers or symbols to represent objects and then manipulate them according to the rules they have established. "My work is all really based on one big idea: that everything can be expressed as a symbolic expression," he explains. Because these kinds of simulations can be performed in a hypothetical universe rather than one bound by the laws of nature, he argues, computer experiments represent "a new kind of science." When Wolfram first turned his attention to complexity studies in the early 1980s, he was looking for a way to explain complex phenomena—the patterns on mollusk shells, the behavior of molecules swirling in turbulent fluid, and fluctuating prices on the stock market. "I tried to use methods from statistical mechanics and various other quite formal, sophisticated areas of physics, and I was fairly disappointed that I did not get very far using these conventional methods," Wolfram says. "It is quite plain that the [conventional] approach has been a failure for biology and studying more complex physical systems." Instead, he developed a computer-modeling device called cellular automata. Cellular automata are self-replicating, self-organizing groups of cells that live, die, and form patterns based on simple rules that instruct each cell to change its behavior in accordance with the behavior of neighboring cells. They provide a uniquely useful tool for scientists studying how the interaction of individual elements influences a system as a whole. As in nature, it is extraordinarily difficult to predict what pattern will result from a given set of rules. The only way to find out is to set the initial conditions and let the program run. "I found that very simple rules, instead of producing fairly simple behavior, actually produce extremely complicated behavior," Wolfram says. "That is a piece of intuition that many people just haven't got yet. When you see a complicated phenomenon in nature, your instinct is to try and make a complicated model to explain it. Somehow, nature itself does not need that. People don't understand that there are really simple experiments that can tell you really interesting things about, for example, how biological systems can be constructed." Scientists in a variety of fields have begun using cellular automata and other kinds of computer simulations to investigate questions traditional physics can't answer. Physicist Per Bak at Brookhaven National Laboratory is looking into his computer for a theory that accounts for the ability of matter to organize itself into ever more complex forms. Stuart Kauffman at the Santa Fe Institute is investigating self-organizing behavior as a key to understanding the origin of life. Langton at the Santa Fe Institute is developing standardized computer programs to allow researchers to study complex systems, from a collection of single-celled animals in a pond to a group of competing companies. But Wolfram, once again, is going his own way. In his view, much of the research into complexity is "impenetrable nonsense" with "a fair amount of rhetoric and not much science." But when it comes to trying to explain his own work, he shares the difficulty: "I am talking about concepts that are reasonably fundamental and reasonably abstract. That means most words that describe it sound vacuous." Where many researchers are using complexity studies to explore biology, Wolfram says he is exploring the underlying order of the universe itself. "I wondered what would happen if we started from scratch and ignored everything that had been achieved in physics, to see what we could do," he says. "I have spent the last 10 years doing the most obvious experiments. Of course, you often do not realize they are obvious until you have been thinking about it for years. Computational physics "is a great field because nothing is known, absolutely nothing," he declares. "There is a computer universe there that just has not been looked at." Wolfram is somewhat sheepish about the secrecy of his work, but says he simply wants to work undisturbed by intellectual competition. Not everyone is bothered by his silence. "Maybe Stephen has a really good idea but is just being very careful about building a solid case for it," Langton says. Colleagues around the country say Wolfram has alluded to some of his findings in internet exchanges with a few key researchers. "He is wrestling with what is probably the hardest question in physics—the relationship between physics and computation. That is a pretty heady topic," says Danny Hillis, an influential computer theoretician who pioneered the concept of massive parallel processing, the basis of most new supercomputer designs. "He has given only tantalizing hints as to what the answers he has found would be," says Kolb at the University of Chicago. "He seems confident he is on to something." "He is looking for some deep connections between fundamental physics and fundamental ideas in computer science," says Gregory J. Chaitin, a noted mathematician at IBM's Watson Research Center. The idea that the way the universe works is analogous to the way computation works "is a very intriguing idea that a number of people have speculated on, but there has been no serious work. Maybe he won't find anything. But maybe he will find something very interesting indeed." Whether Wolfram succeeds or fails as a physicist, the manner in which he has chosen to pursue his research poses some provocative questions for the practice of science. What sets Wolfram apart is his insistence on working independently, not just without collaborators but also without the supporting superstructure of the conventional research establishment: he relies on his own funding and equipment and has no one to answer to but himself. "My view about doing basic science," he explains, "is that if you have no choice, then getting paid by a university is a fine thing to do. If you have a choice, there are a lot better ways to live. "As CEO of a company, the fraction of my time that I get to devote to basic science is probably much larger than the fraction of time that a typical senior professor at a university would devote to basic research. If you are a senior university professor, you are out raising money from the government, being on committees, and teaching classes. It is only in the extra bonus time that you get to do research." Wolfram says he wants to revive an older tradition in which people pursue science as a personal calling, whether or not they are the beneficiaries of public patronage. Too many scientists today, he says, give up their research simply because they can't get the public to pay for it. Indeed, one of the attractions of computational research, he says, is that it requires nothing more expensive than a personal computer. "I don't have to beg the government," he says. "I don't have to convince anyone at the National Science Foundation that what I am doing is not as nutty as they might assume or as the peer review system might say it is." No public funding, however, means no real obligation to communicate his findings, and no need to submit himself to peer review. "It may sound arrogant, but I have moved pretty far away from what most scientists know about," Wolfram maintains. "That means there are fewer and fewer people I can talk to about what I am doing. Your typical top scientist does not know this stuff. "I am my own reality check," he concludes. Some researchers say Wolfram is blazing a path for other scientists to follow. With full-time faculty research jobs scarce and funding for basic industrial research increasingly rare, many scientists are seeking new ways to balance the demands of commerce against the lure of knowledge for its own sake. And the idea of financial independence is becoming more attractive. By creating a software company to support his work, "he has built a new model for funding science—the scientist as entrepreneur, rather than the scientist as public welfare recipient," says Sejnowski at the Salk Institute. Wolfram, he says, reminds him of Edwin Land, who founded Polaroid and then continued to pursue basic research into the physics of color and vision in his corporate lab. "In starting your own business," physicist-turned-entrepreneur Packard concurs, "you don't have to deal with the same kind of political complexities, and you don't have to tolerate a lot of the bull you have to tolerate in a university. You are not at the whim of the scientific culture of some funding agency." There is certainly no shortage of iconoclastic loners in contemporary science. Princeton University mathematician Andrew Wiles spent seven years working secretly in his attic to polish a 200-page proof of Fermat's Last Theorem, one of the most famous problems in his field. When he unveiled his solution in a series of dramatic lectures in 1993, he made headlines around the world. Only then, however, did a sharp-eyed graduate student spot—and help fix—a critical error. Indeed, the aloofness that Wolfram considers one of his virtues, others see as self-defeating. "He is battling with himself when he chooses to work in complete isolation," one former Princeton University associate says. "He is hurting himself by not interacting more with the scientific community at large." Other colleagues worry that his research muse has become a computer widow. In the past 18 months, for example, he has had little opportunity to brood on basic science, concentrating instead on polishing the new release of the program. They question whether Wolfram will ever be willing to loosen his hold on company operations enough to permit sustained, reflective research. While admiring his commercial success, they worry that he has been sidetracked by his tools—like a sculptor who spends all day sharpening her chisels but never sets one to marble, or a novelist who spends all day fiddling with the fonts in his word processing program. "He has invested a lot of time in [Mathematica]," Hillis says. "That is great for the rest of us who use it, but it is probably bad for physics." The program Wolfram developed to facilitate his own research may, in the end, overshadow it; the man who sought such a prominent place in the history of science may have to settle instead for a mention in his own company's annual reports. But as the scientific community waits and watches, it is not yet clear how this particular high-wire act will end. Wolfram remains balanced delicately on the tightrope of his ambitions. "I seriously doubt that Stephen would set himself up for the fall he would take if he never delivers on the promise," Langton says. "I am willing to place my bets on Stephen, even though I don't know when they might pay off."